This section shows your test results. Please fill out the information below to register with MCB Hawaii Marina. You will then be taken to a page to register for a bay check. Sail perpendicular to the wind. Let out the main sheet. Make sure your crew is okay. Pull the tiller away from the sail. Reposition the crew to the lee side. Sound a horn 3 times and hold your course. Nothing, you have the right of way. Edge closer to the reef and hope the other sees your action and alters course. Immediately and firmly turn away from the reef and allow the other boat to pass. Do not sail between the buoy and land. The water between the buoy and land is for private craft only. Do not anchor within 500 yards of the buoy. Restrict the speed of your craft to 5 knots. You are sailing your craft on a port tack and you are on a collision course with another vessel, which is sailing on a starboard tack. You have the right of way. You are sailing in the bay and overtaking a small motorboat, which is trolling. Since you are in a sailboat, you have the right of way and the motorboat must yield. A jibe is a maneuver in which the bow of the boat passes through the wind. When departing the dock or “backing,” remember to push the tiller the way you want the boat to go. When returning from the ocean into your harbor, you should keep the RED channel markers on the port side of your boat. When turning around to pick up a man overboard, it is safest to tack. Tacking means turning your craft so that the bow crosses through the “dead area” and you resume sailing with the sail now moved to the opposite side of the boat. A sailboat is on starboard tack if the _____ is on the port side of the boat. When sailing on a run, you should be careful not to sail _____, or you may accidentally jibe. The ___ keeps the boom flat when sailing downwind and can be used to prevent accidental jibes. A ___ knot is best for attaching sheets and halyards to a sail. What is usually tied to the end of the boom, holding it off the deck? After you tie the halyard to the head of the mainsail, why is it important to free the mainsheet before raising the main? What part of the sail do you attach first when rigging the jib? What should you check is in place before pushing your boat into the water? After pushing your boat into the water, but before you cast off, what should you check? It is highly advisable to have your main raised before shoving off from the dock. Use this diagram to answer Questions 39-48. 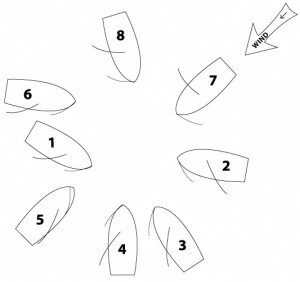 Assuming that all boats are sailboats with the wind as shown, which of each two boats mentioned has the right of way and why? Question 39. Boat 1 or 2? 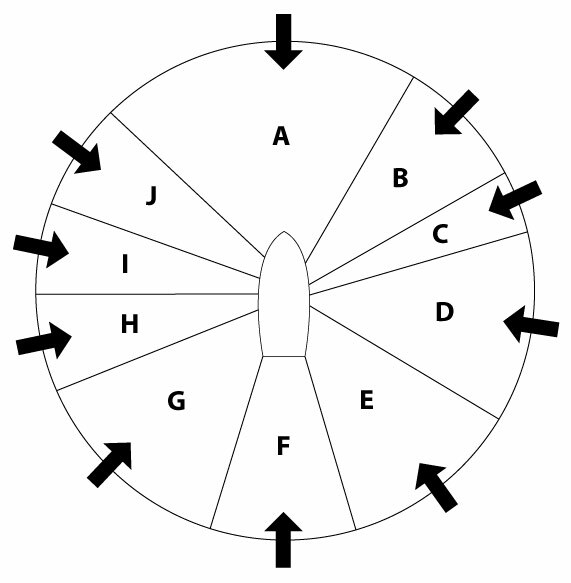 Refer this diagram once again to answer Questions 49-56 . The boats are either on a port or starboard tack. Indicate which tack each boat is on. Question 49: Boat 1? For Questions 62-71 use the following diagram. 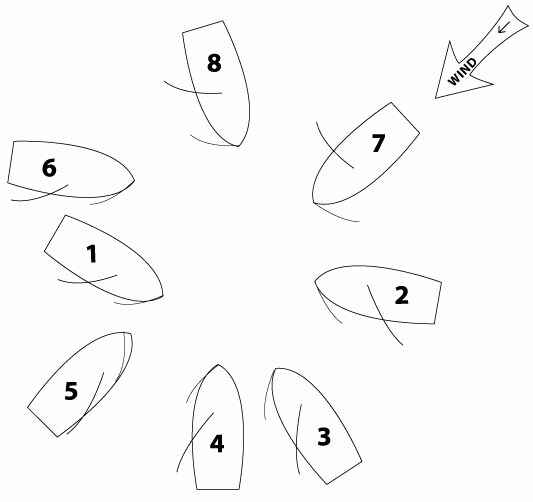 Choose the correct label for each area of the sailing circle, when the wind is coming from the direction of the different arrows. Question 62: Area A? Keep trying! You will need to take the test again.